We have awoken today to a populist and conservative US President (elect) in an America engaged in a long-stare with resurgent Russia, whilst Britain thrashes through post-industrial collapse in the iron grip of an implacable woman. You could be forgiven for thinking it was 1988 again. So, I expect great things from bands with drum machines…! In more local affairs, The Blogging Goth has spent an exhaustive few weeks hurtling around the North of England. First off, I was – appropriately enough – speaking at Manchester Gothic , the premier public-academic conference on Gothic studies, with their theme of The Gothic North. I have covered the three previous Conferences, and was well aware of the highly professional arena I was stepping into! 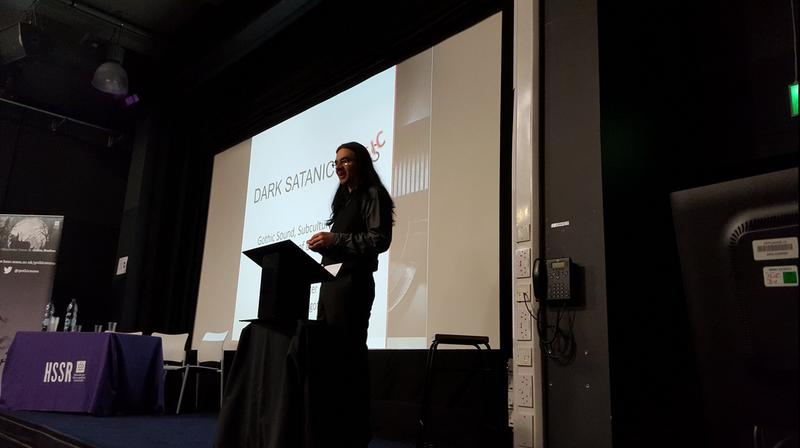 Nevertheless, being public orientated allowed me – a mere BA – to join far more qualified and experienced individuals, and permitted me to hold forth on a topic close to my (black heart); my presentation was entitled Dark Satanic Music: Gothic Sound, Subculture and the North of England. I am beholden to Manchester Metropolitan University, and the Centre for Gothic Studies, for graciously inviting me to speak, and I am more than happy to let them do the reporting of the conference for once! Please absorb the highlights of all the speakers that day, as I did my best to do. Time for a very quiet Halloween then, as I and the rest of the Goth (not Gothic!) 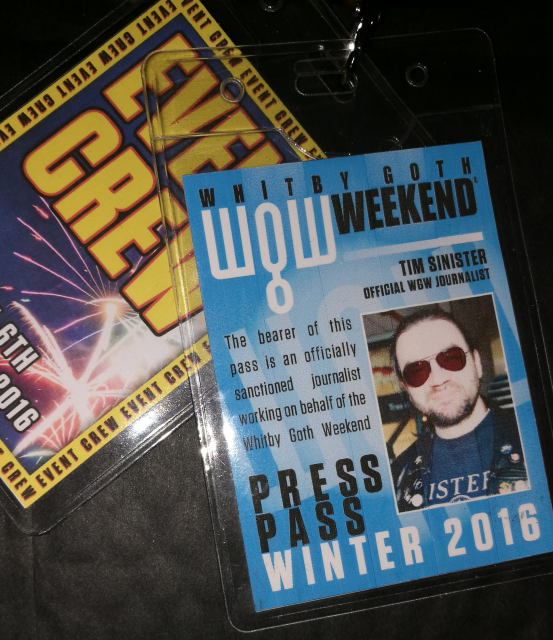 community geared up for the second big event of our black calendar, Whitby Goth Weekend Winter! Running across 4th-5th November, and a few days either side, this was my third installment of the long-running alternative music festival as an official Press Officer. As grandiose as that sounds, it means a lot of running around after serviceable WiFi signal in the most isolated town in a particularly desolate – if beautiful – corner of Northern England (see that connection again?). Oh, I held a door open for Wayne Hussey at one point, but the bands are usually there to get the gig done, not chinwag overmuch with bloggers and the like. So, I have a handful of drunken notes to try and translate into serviceable reviews, which will come soon. The short answer is, of course, another banner year of Goth music. The Saturday night especially saw a lineup of quality classic Goth culminating in a mammoth show by Hussey and The Mission. There was also a ridiculous amount of drinking, clubbing, socialising, shopping and sleeping like the dead. WGW is a full-spectrum experience, and I strive so hard to try and tell people about the aspects of the festival the conventional media doesn’t see, when they’re traipsing around old town photographing people who don’t even come to the live event. So watch this space for my review of WGW Winter 2016! No rest for the wicked, or the dead, it seems. On Wednesday 16th November, I’ll be pretending to be an expert again, and joining a select few to discuss the History of Goth Capital itself, Leeds. Just one panel in a bulging itinerary of events aimed at celebrating the proud home of UK Goth – even when the Batcave, Slimelight and all Camden have been gentrified to dust. I might even stay in Leeds until Saturday 19th, when The Sisters of Murphy tear up the joint like it’s 1985 again. That should tide me over until Saturday 26th November, when Eldritch’s Real Thing brings a brief UK tour to an end in the City of Steel, in the original People’s Republic. An exciting few weeks keeping the black heart pumping in the North. As I said time and again in my presentation in Manchester, the North has always been the spiritual and psychological home of Goth, regardless of what clubs started what bands, and what shops were open in (North) London. This entry was posted in Uncategorized and tagged academic, America, bands, event, festival, goth subculture, Gothic Manchester, links, media, music, personal, PR, Whitby Goth Weekend. Bookmark the permalink.